As you can see from Cuihong’s recent photo, she has an infectious smile! We met recently at a Boise public library to discuss this success story and it became apparent she has a warm personality to go with her engaging smile. Cuihong came to the U.S. in 2012 to marry her fiancé, who was a longtime friend she’d met while they were both attending the Sun Yat-sen University in Guangdong, China. After graduating from that university, Cuihong became a CPA in China and was one of 17% to pass the exam the first time around. After arriving in the U.S., Cuihong found employment immediately as a supervisor in a local Chinese restaurant. While she was grateful for the work, Cuihong longed to return to her career as an accountant. She returned to school to pursue this dream and graduated from Boise State University with a BS in Accounting in 2015— all while working and keeping a 3.3 GPA. Cuihong learned of Global Talent Idaho through the College of Western Idaho, where she was taking English classes while attending BSU. 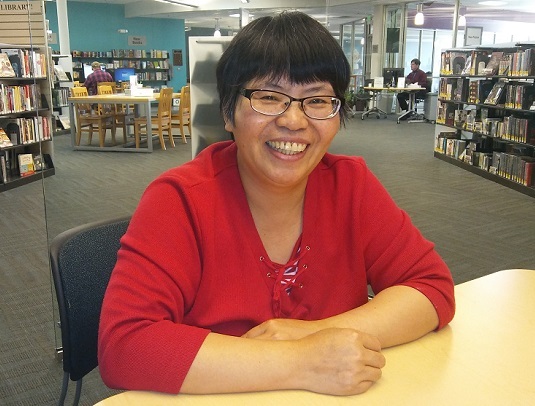 After enrolling in the program, Global Talent Idaho assisted Cuihong in developing a professional resume, reviewing job applications, and helping her prepare for interviews. Cuihong found that determination and persistence were key to landing a professional job. She estimates that she applied to over 50 jobs but she did not give up hope. Cuihong continued to self-reflect and move forward and her persistence eventually paid off by receiving a job offer! In early 2017 she was hired by Brothers Express, an Iraqi-owned small business that got its start through Economic Opportunity, another Jannus program. As a member in their accounting department, Cuihong works fulltime while studying for her U.S. CPA exam. She has already passed three of the four CPA segments and plans to pass the other one soon. Cuihong’s goals after receiving her CPA license is to work as one in the Boise area, which she says will be a dream come true!